Thanks for printing! Don't forget to come back to Zerorez Carpet Cleaning for fresh content! Zerorez Franchising Systems, Inc. held its 13th annual franchise conference in Salt Lake City, Utah on March 2-4. The conference featured several collaborative breakout sessions, presentations, an award banquet, and the first ever company ski day. The conference was well attended, and franchisees felt they were given tools and resources to assist with operational growth in their own franchise locations. The final presentation of the conference was delivered by Shawn Moon, Executive Vice President of Franklin Covey, who is also a member of the ZEROREZ® Board of Directors. Mr. Moon’s topic was "The Zerorez® Way: Creating and Reinforcing a Winning Culture." The carpet cleaning services franchise conference agenda also featured a meeting of the Franchise Association where annual business was conducted including a financial review, election of a new officer, and gathering of feedback for the corporate team. The business portion of the conference featured updates to corporate policies, a review of the brand’s growth and development, and a session focused solely on customer satisfaction presented by the company’s customer satisfaction measurement partner, Listen360. Franchise owners divided into franchisee panels on day two to share experiences and discuss topics including call center effectiveness, recruiting, retention, marketing, and growth strategies. 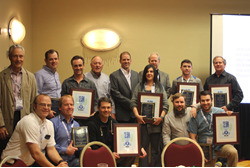 A highlight feature of each Annual Conference is the awarding of numerous franchisees for their hard work and commitment to helping the company reach its goals. The company also awarded the coveted Franchise of the Year award to Jeremy McGee, owner of the Spokane, Washington franchise for his contribution to the entire organization, success in his franchise market and his expansion and development in other territories outside of Spokane, WA. Zerorez® Franchising Systems, Inc.’s corporate office is in metro Salt Lake City, Utah, and its franchise organization is coast-to-coast in 27 states. In recognition of its cleaning efficacy, the Carpet and Rug Institute (CRI) has awarded Zerorez® its Platinum Rating, the cleaning industry’s highest rating. See http://www.zerorezfranchise.com for more information or to contact the corporate office.